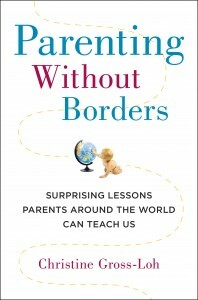 In the Introduction, we broached the idea that the way other cultures parent might be more “right” than the way that the culture in North America parents, as discussed in the book Parenting Without Borders. In Part 1, we looked at some of the different cultural thoughts around sleep. There was also that stunning example of how it’s normal for babies in Scandinavia to be found taking a nap on the terrace in the dead of winter! In Part 2, we explored “stuff” and how having more of it might not be best for our children. In Part 3, we looked at how different cultures relate to food in the context of parenting. In Part 4, we looked at how saying “good job” to our little ones might not have the effect we think it does. In Part 5, we talked about the virtues of allowing our little ones the space to work through problems on their own. In Part 6, we examined the importance of unstructured “play.”In Part 7 and Part 8, we explored what education is like in East Asia and Finland. In Part 9, we looked at cultural notions of kindness in raising kids. In Part 10, we’ll explore the possibility that parenting might be fostering a sense of helplessness in children today. Yes, the title of this post is a tad clickbait-y, but after reading the final chapter in Gross-Loh’s Parenting Without Borders, I can’t help but think that the reams of university students who’ve landed in their parents’ basements upon receiving their diplomas has something to do with the way they’ve been reared. Of course, there are many other factors at play (including things like the economy and recessions, etc. ), but I don’t think that this ideas is too fantastical. Remember the anecdote from Part 9: “In 1970, the primary goal stated by most college freshmen was to develop a meaningful life philosophy; in 2005, it was to become comfortably rich.” Well, there’s also a big difference in the way that kids are treated at home (even within a given country). In 1950, an eleven-year-old growing up in a one-bedroom apartment in Brooklyn was responsible for waking up on time, making his own breakfast, and getting himself out the door. […] He also did the family shopping: going to a corner grocer to buy bread or rolls, or to pick up milk. “I pretty much do all the chores in the house,” [says a mother of three pre-teens aged nine, eleven, and twelve]. According to the author of The Anthropology of Childhood, it’s “absolutely universal” for children to want to help adults in their communities. We think that sheltering kids from work will help them succeed in all those extracurriculars and allow them more time to complete all that homework. The issue here is that while kids want to help, we’re unintentionally squashing that motivation. When we ignore our children’s eagerness to participate when they are younger, they internalize the idea that contributing is unimportant and they are helpless. They also begin to expect that things will be done for them. Chores, even if not perfectly done, help children gain good self-esteem and make them feel like they are contributing to the family. And isn’t that what most people want for their kids, anyways? A well-developed sense of self-esteem and a healthy desire to contribute to the world around them? Simply asking children to do chores isn’t enough — it needs to be part of our expectations (or boundaries?). They key here is not necessarily that kids are learning how to contribute to the home, but that they’re learning to feel responsible for themselves. This fosters a sense of self-reliance, so that when they’re older, they know that they’ll be able to figure things out and maybe more importantly, that they’re responsible for figuring things out for themselves. [They] prepare an entire meal for their parents at school and had them do everything by themselves, from paring the potatoes to cutting the meat and carrots for the stew with chef’s knives. Because the social expectation in Japan was that children were capable of acting responsibly and doing chores, the kids had daily practice in helping out at school. Our kids were getting clear and frequent messages about how highly and valued it was to be helpful, self-reliant, and responsible from just about everyone — teachers, friends’ parents, and even from their own friends. How many parents in North America do you think would let their five-year-olds use a paring knife, much less a chef’s knife? Another poignant quote from the chapter: “When people talk only about what they’re protecting their kids from, they’re not thinking about what they’re depriving them of.” If we don’t give our little ones the chance to fail, how will they learn to succeed? Brief related tangent — I came across a delightful article recently where a father’s daily question to his kids was, “What did you fail at today?” The idea behind it being that failure is a necessary part of growth. Building on some of the points on autonomy and self-reliance in this chapter, Gross-Loh also explained the way we ask our children to do things matters. Think about how you like to be asked to do something. If someone is off-handedly demanding your attention while you (and they) are engaged in other tasks, are you interested in complying? Probably not. Now imagine you’re a 5-year old. Do you think you’d be more or less likely to comply? Individuals higher in dispositional tendencies to experience awe exhibited more generosity in an economic game (Study 1). Experimentally inducing awe caused individuals to endorse more ethical decisions (Study 2), to be more generous to a stranger (Study 3), and to report more prosocial values (Study 4). A naturalistic induction of awe in which participants looked up at a grove of towering trees led to increased helpfulness, greater ethicality, and decreased entitlement (Study 5). There’s so much to unpack in these findings. Experiencing awe can make us more generous, more ethical, more altruistic, more helpful, and less entitled. These findings have implications for a number of areas, not the least of which, is essentially, creating a roadmap for how to be a better person. It would seem, as hypothesized, that awe leads to more prosocial tendencies by broadening the individual’s perspective to include entities vaster and more powerful than oneself and diminishing the salience of the individual self. So, maybe instead of writing articles highlighting different perspectives, I should be writing fiction (or articles) that allow you to experience a sense of awe? In thinking about the findings of this research, I’d be very interested to see how it plays out in the Prisoner’s Dilemma. I imagine that the results would probably still hold, but it’d be great to have confirmation of that. Furthermore, I’d be interested to see how economists would incorporate this into our understanding of the “rational actor.” If we’re experiencing awe and, as a result, becoming more prosocial, it would — theoretically — begin to wreak havoc on the idea that we’re acting rationally (as it takes a laboured interpretation of the rational actor to include prosocial behaviour). Just for good measure, here’s a second picture that I hope allows you to feel a sense of awe.